After five all-consuming seasons of Breaking Bad, it’s mind-blowing to step back and remember that Bryan Cranston once played the goofy dad on Malcolm in the Middle. What’s even more unbelievable is just how believable he was in both roles. For six years, Cranston made us laugh as Hal, the well-intentioned but not so bright husband to Lois and father to four rambunctious boys. He rollerskated, he did Dance Dance Revolution, he made up a song about his belly — in other words, he was amazing. Then, as if Cranston rebirthed himself, he reemerged as the most calculating and manipulative drug kingpins in TV history. And we all know how masterfully he plays the role of Walter White. 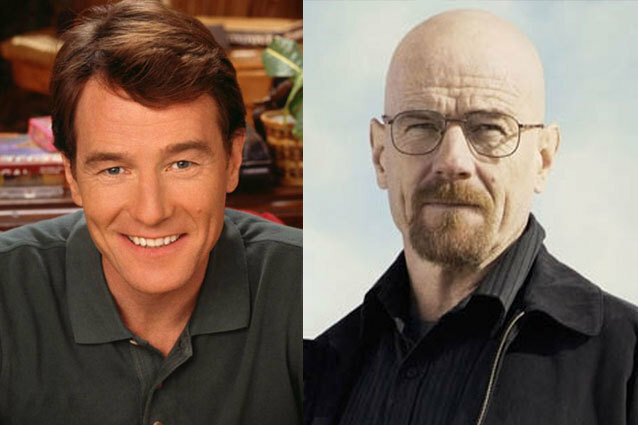 In honor of Breaking Bad‘s finale this Sunday, let’s take a look back at just how different these two characters are. Always the goofball, Hal loves to show off his dance moves. Not to mention his flair for rollerskate choreography. Remember how Walt ruthlessly hunted that fly? Here’s how Hal handles a spider in the house (like a little girl). This is what a typical family dinner is like with Hal. This is a pretty common expression for Hal, who has a habit of getting himself into trouble. Walt, on the other hand, may get himself into trouble, but he almost never loses his cool. He plays the role of drug kingpin very convincingly. Although, once in a while, his rage gets the best of him. And rage he is full of. But sometimes also calm and composed cruelty. Plus absolute psychotic behavior. The terror on Skyler’s face gives me the chills. Man, he’s come a long way from Hal. Walt gets attacked by knives. While Hal does the attacking. But sometimes they can be surprisingly similar. For instance, Hal’s scientific methods of making the household snacks tastier. And Walt’s occasional spurts of snazziness, which embarrass Jesse the way Hal embarrasses Malcolm. …can still be found in Walt’s, on a few rare occasions. Hal also taught chemistry (although a very different kind of chemistry). And last but not least, the most significant similarity between Hal and Walt is…their love of tighty-whities.